Hi Munchkin Blog readers! @lunchesandlittles here! It’s been a few months, but I am back with another recipe to share and I am super excited to be doing so. Last time I shared it was summertime and now here we are with school days now in full swing. Sometimes I seriously cannot believe how fast the time goes, especially with kids growing up and changing so much. Between kids, laundry, work, plus a million other things, and now for some of us – school schedules thrown in the mix, motherhood doesn’t always leave us with a bunch of time (understatement of the year, right?). And that is why over the last few months I’ve been busy focusing on simple, fast meals; perfect for any evening – especially a busy weeknight. And what is easier than a meal that gets all cooked up in one pan or pot? These are my absolute favorite kinds of dishes to make and share with all of you. Now, I know that a lot of parents are apprehensive to introduce spices or any kind of heat to our littles, but I have come to find that our kiddos love varied flavors as much as we do; we just need to give them a chance to actually love them. As I have explained here and on my feed before, my husband and I love bold flavors and we have always believed that our kids should eat the same foods as us (one family = one meal). 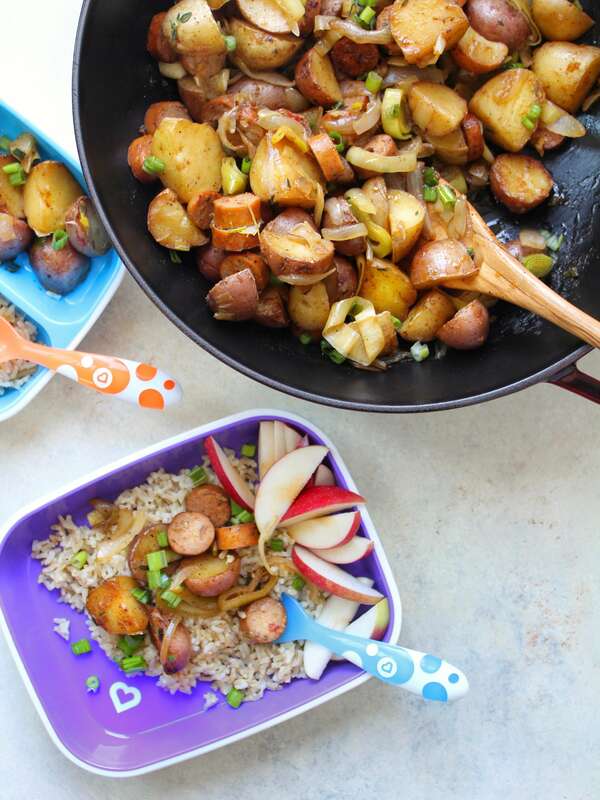 This new dish; Sweet Cajun Sausage and Potatoes is flavorful, kid and parent approved, and all gets cooked up in one pan or pot. In addition to a little Cajun flavor (don’t worry it is not too much! ), this dish has a hint of sweet and also includes leeks and/or green onions, which are flavorful additions that often get omitted when it comes to kid dishes. But, their flavor is fab and I don’t think our little ones should be missing out, and so with this one, they are not! What’s great about this dish is that even though everything gets cooked up in one pan or pot, when it comes time to serve things up, you can adjust how it is plated and served. 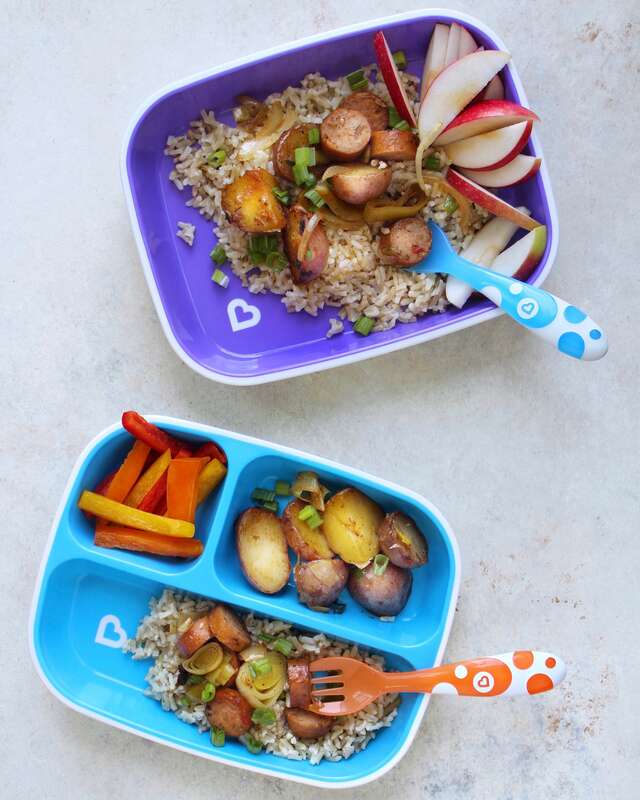 For my husband and I’s plates, we just served it up as is, but for a few of our kiddos we serve it with brown rice and even kept the potatoes separate for one of our kids. 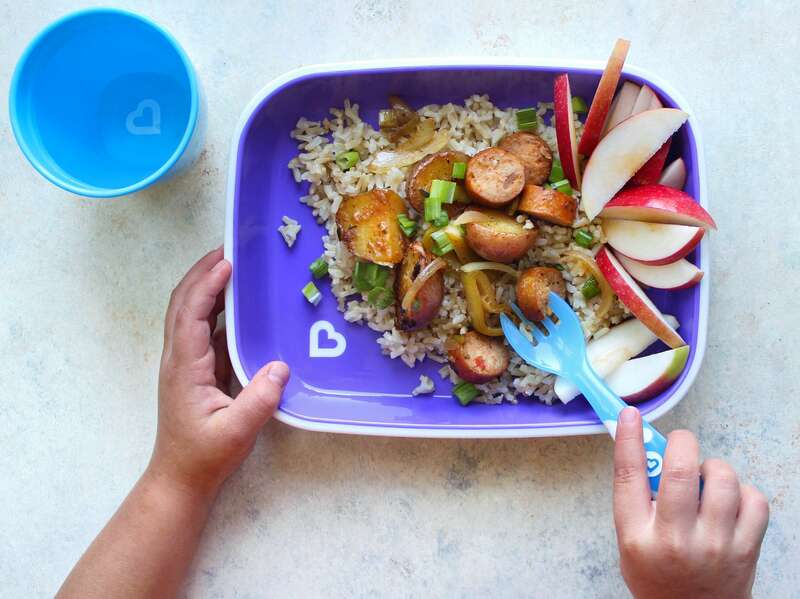 As long as we all eat one meal, we are totally flexible on plating things a little differently for our different kiddos. Personally, I don’t always like things presented the same way as my husband all of the time, and that is perfectly okay. I try and think of that when I serve things up for our little ones, because while smaller they are really no different when it comes to preferences that they have. This recipe serves 5- 6, but can be easily adjusted to your needs. And if you want to add rice, feel free to add that on. We just used a small amount of brown rice for two of our kid’s plates, and prepped the rice according to package instructions. 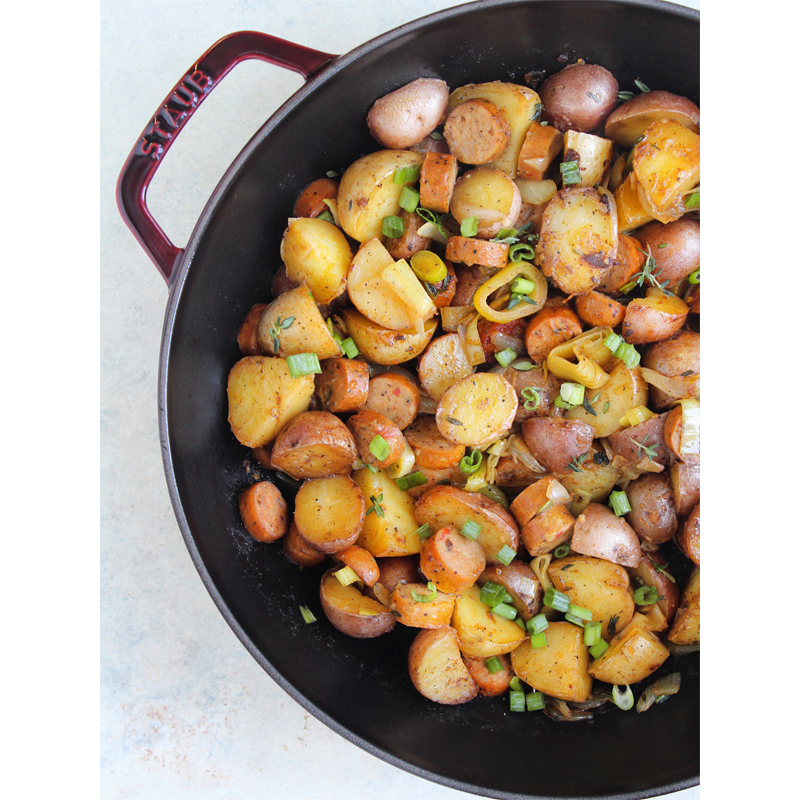 Find the full recipe for this Sweet Cajun Sausage and Potatoes dish below, and enjoy! *you can use leeks or green onions or a combination of both. sprinkle with about half of the Cajun seasoning. Season with salt and pepper to taste and then allow potatoes to start to cook. to break up, but you do want to get this cooking. Cook potatoes a total of 12 min. or so before next step. coat. Cook for 5 minutes, or until leeks begin to soften. • While the above cooks, slice your sausage into small coins (1/4 in thick or so). Then add to pan mixing a bit to incorporate. • Cover and cook for 12- 15 minutes, until potatoes are fork tender and sausage is nicely browned. • Once time is always up, combine honey and vinegar in a small dish. Then pour over the contents of pan and stir/mix to combine. then garnish with chopped green onions. • Serve immediately as is, or top over a bed of rice. Enjoy! For more quick and easy kid-friendly recipes be sure to check out my feed, @lunchesandlittles where I am sharing family-friendly meals, snacks, lunchbox inspo and more all the time. And check out www.munchkin.com for feeding supplies and more for your little ones, like the plates and cups from their new Splash Collection shown above.